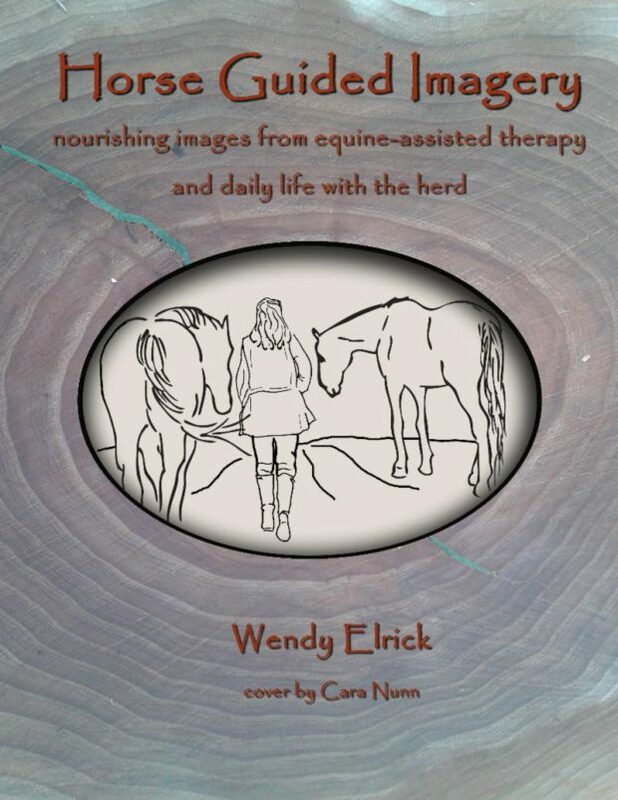 Gratitude | The Equine Connection Coaching Services Ltd. Incorporating a habit of gratitude into your daily life not only makes you feel better, it provides a deeper sense of meaning to our everyday lives. You might set aside a time in the day to be thankful, or you may get in the habit of saying thank you, inwardly, for different things that occur throughout the day. Whatever the practice, the more you really inhale the ‘thank you’, and feel gratitude, the more you will benefit. 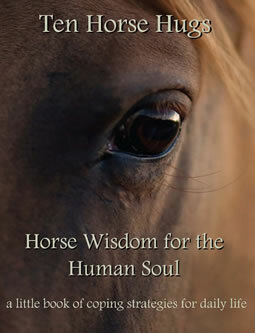 The horses are experts at gratitude. Watching Bandit savour every bit of his daily grain, I can see the appreciation for his food in his eyes. The herd often stands very still, inwardly focused, after finishing their grain. I feel like they are enjoying their body sensations, and attending to how their bodies assimilate the nutrients from the grains. Deep gratitude involves pausing and using all our senses to appreciate the experience! Chunky actually lifts and bends a front leg, and then moves it slightly up and down, thanking me for his grain, and thanking the food itself. When Vienna whinnies at me, and I call back, she thanks me for my attention by giving me eye contact, and blinking once. Similarly, Zaza rubs his body against mine after I respond to his meows to come inside, out of the cold. Our bodies even thank us by sighing, and releasing tension when we give ourselves something we need, like a rest from working, or a sweater to increase our warmth. If you watch your body, you will notice that you release tension whenever you speak a truth. This might happen by sighing, crying, or by softening and relaxing tight muscles. 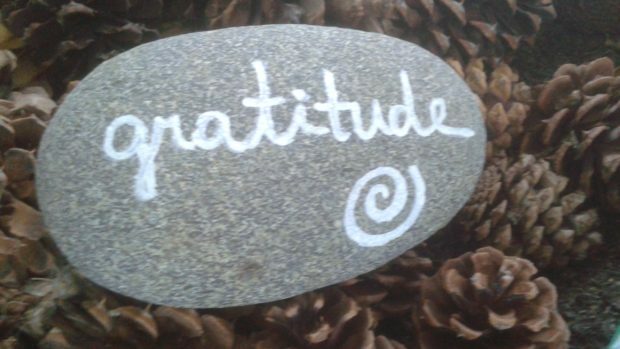 Practicing gratitude is also a way to avoid taking life for granted. In a dominant culture that encourages us to move fast and produce constantly, it is easy to forget the important moments that were stepping stones to the good things that are part of our lives. It is easy to assume we should have all the beauty that surrounds us. The wild cats who have come into my life remind me to continue being grateful. Both Pretty Boy and Zaza came to us as feral cats. 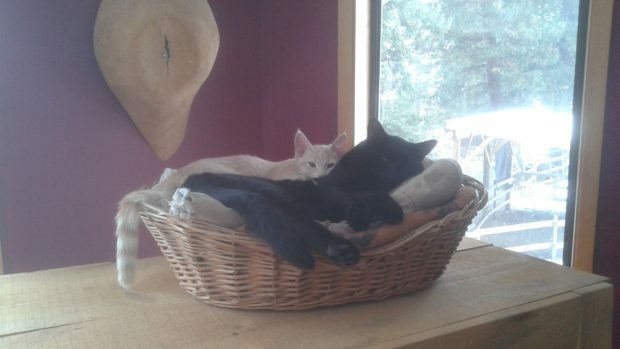 Their lives were quite a bit less comfortable before we welcomed them into our home. Pretty Boy had the scars to show for his ‘life of survival’. Both these big boys, showed me their gratitude for their domestic lives by helping me with the daily outdoor chores. While Pretty Boy is no longer with us, Zaza follows me around the property while I do chores. I feel he is often guarding the property, and that he is always acknowledging the efforts taken to create the life he now loves. His gratitude is comforting.